Disclosure: Penguin Kids sent me a copy of this book in exchange for an honest review. All opinions are my own. The links are affiliate links where I will receive a small percentage of any purchases made through them at no cost to you. Thank you for supporting Crafty Moms Share! The reading specialist at Hazel's school recently told me she heard that at least 50% of what kids read should be nonfiction. 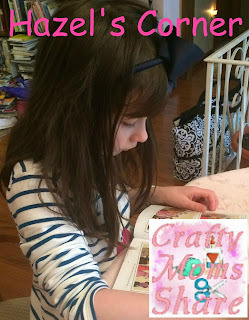 Do your kids read nonfiction? Hazel actually loves biographies and historical books. 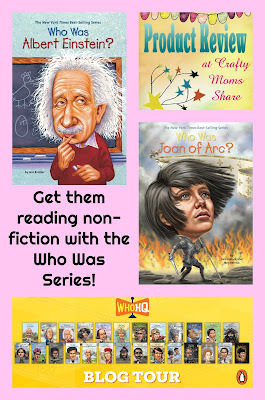 One series that she loves is the Who Was Series. This series is for the middle grades or ages 8-12. Today we get to share two fun books from this series. These two characters are paired together in an episode on the Netflix Who Was? Series. We will be sharing Who Was Albert Einstein? and Who Was Joan of Arc? Hazel was very excited to read these books and she will be doing a Hazel's corner on Joan of Arc. First we will look at Who Was Albert Einstein? by Jess Brallier. 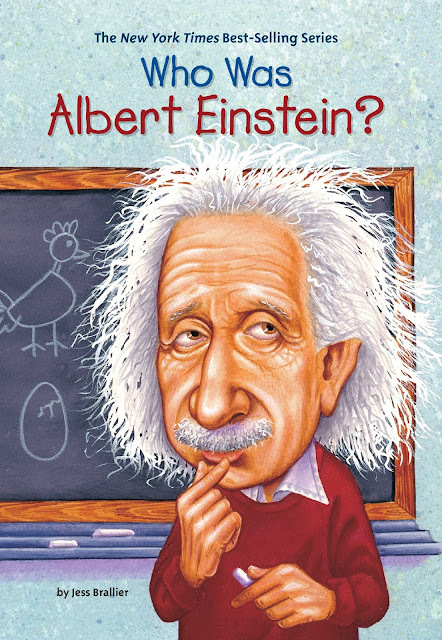 Now as a mathematician I know a bit about Albert Einstein and we have read other books about him. I learned quite a bit about Einstein from this book that I did not already know. I always love learning more about people's lives and personal quirks. Einstein certainly had many quirks of his own. He was truly an amazing thinker. His ideas seemed so out there to many of the scientists at the time, but he was proven to be correct time after time. I love the quotes in this book. Einstein said some amazing things and this book starts each chapter with these quotes. Einstein was more interested in using his brain than much else. His appearance did not matter to him and he would probably not eat until someone put food in front of him and his life was very much going on around him while he was full of thought. It is such an interesting story. Plus the things he helped bring to life--television, the atomic bomb and more. We also get to share Who Was Joan of Arc? by Pam Pollack and Meg Belviso. 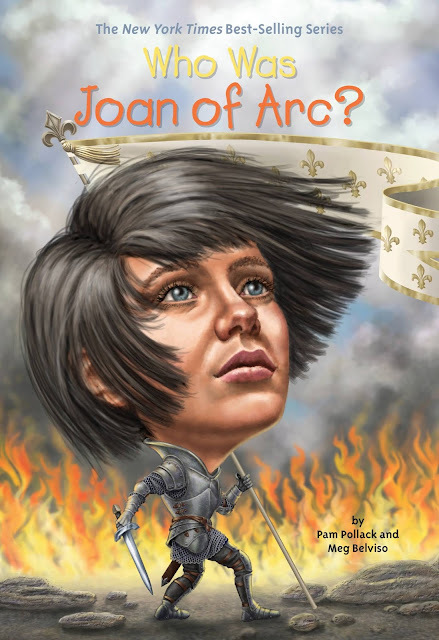 What do you know about Joan of Arc? I will admit as a non-Catholic I did not know too much. I saw The Messenger back when it came out in 1999, but still don't feel like I really knew much about her. It amazes me how young she actually was and how so many of the religious authorities were doubting her and how the king she helped become king did not help her in the end. This book was such a fun read. I learned so much but also the story really flowed. I read it so quickly because it was so interesting. I didn't want to put it down. Hazel read it in a couple of hours as well. Let's face it, Joan of Arc's life was very active and interesting. She truly believed the angels spoke to her and she saw the archangel, Michael. She proved time after time that she was hearing God's word by winning the battles and predicting what would happen on different days. It is such an interesting story. And she was a teenager!! Can you imagine? This story is so amazing and it is a great story to read for kids and to talk about no matter what religion you are. Hazel wants to share her opinions on this book with you. So here is Hazel's Corner! Things I love about this series is that throughout the books there are asides to explain things that are mentioned in the book. They explain things like saints and knights in Joan of Arc and the Nazi's and Germany. The notes teach even a bit more of history and help put the stories into context for the kids. This series is such a fun one and there are books about all sorts of people that there is sure to be one your child would enjoy. I hope you will check them out! !